The outer reaches of San Miguel County offer some of the most awe-inspiring landscape and views in the world. Yes, in the world! High enough above the canyons to provide a wonderful perspective of the San Juan Mountains, the alpine mesas really make you feel that you’re in “God’s country”. Interspersed with stands of aspens, forests of firs, rolling green meadows, and valleys with rushing streams, these mesa properties offer striking 3 to 200 acre home-sites within a 20 to 40 minute drive to Telluride. Many stunning parcels of land on the outlying mesas surrounding Telluride have been developed with services, including buried electric lines and maintained county roads. 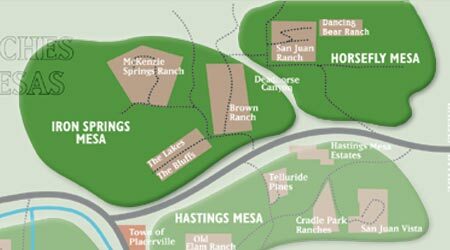 “Ranch parcels” are usually defined as pieces of land from 35 acres on up and “subdivisions” are those from 1 acre to 35 acres. The ranch parcels offer wonderful getaways for those who love open spaces, privacy, unbeatable views and western outdoor living. All information below is accurate as of February 1, 2006. Price range: From $168,000 up to $6.5 million. Size range: A few 5 acre parcels available, many are in the 75 to 125 acre range, the largest is 575 acres. 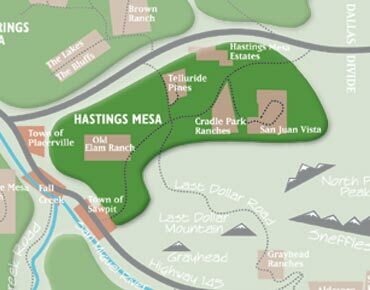 This mesa was homesteaded in the late 1800’s and has several historic ranches still extant. It contains several ranch parcels and 4 subdivisions with 5 to 40 acre pieces. Much of Hastings is off the electricity “grid”, and a unique solar-powered subdivision, called Old Elam Ranch, provides water pumped by solar energy. Recently, power lines have begun to make there way into Hastings Estates giving the option to owners for electricity or solar power. Located at the west and northwest end of the Sneffels Range, Hastings provides good views within a 20 to 25 minute drive to town. As of February 1, 2006, there are 2 parcels for sale from 5 to 35 acres at $230,000 to $525,000 in price. 4 homes are available from $445,000 to $1.3 million. This area, located north of Hwy. 62 and the Sneffels Range, has larger ranch parcels. A bit further from Telluride with a 30-40 min. drive, Horsefly features some great horse country and quick access to Ridgway and Montrose. As of February 1, 2006, there are 20 parcels for sale from $168,500 to $4.8 million, ranging in size from 5.9 acres to 575 acres. 7 homes are for sale from $240,000 to $3.3 million. 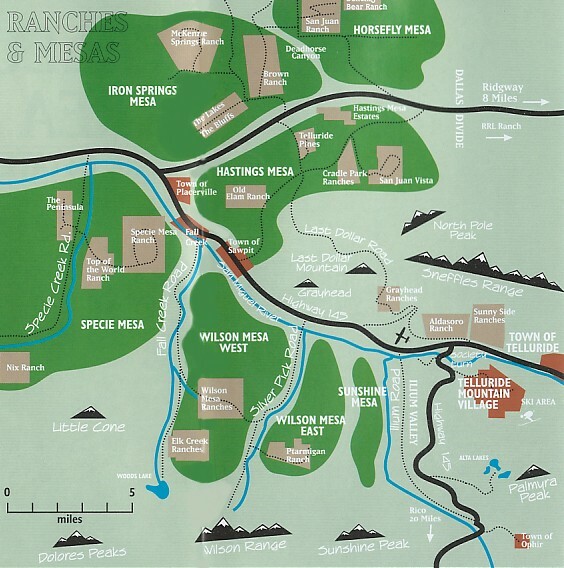 Located west of Wilson Mesa, about a 30 to 40 minute drive from Telluride, Specie Mesa has 2 mega-ranch parcels, 3 ranch areas and 1 subdivision. Specie has great views and wonderful wide-open spaces. As of February 1, 2006, there are 2 parcels of vacant land for sale; one is 35.2 acres, the other is 548 acres. They are priced at $265,000 and $6.5 million, respectively. Three homes are for sale priced from $1.2 million to $3.5 million. 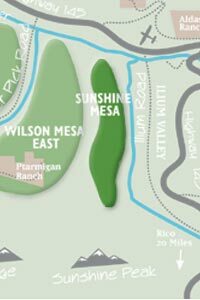 Wilson Mesa contains several stunning ranch parcels and a subdivision called Wilson Mesa Ranches with 3 to 40 acre pieces. 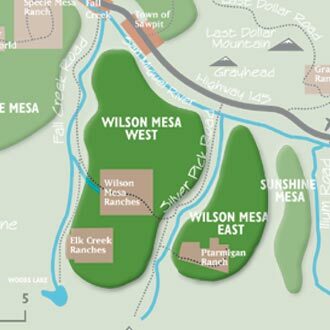 Wilson Mesa to Telluride is a 20 to 25 minute drive. As of February 1, 2006, there are 9 parcels for sale ranging from 7 to 451 acres and from $495,000 to $6.15 million in price. There are 8 homes on the market from $835,000 to $19 million.